The greatest majority of cars use a liquid cooling system. The objective of the system is to maintain an operating engine at a constant temperature regardless of whether the car is based in Alaska or Florida. If the operating temperature of the engine falls below a certain point, emissions will rise and fuel economy will drop. The engine block and the cylinder heads have channels that carry coolant, the coolant is pumped through the system using a water pump and the thermostat, which is located in the coolant housing, controls the coolant temperature. A radiator is used to cool the coolant once it has cycled through the engine. A radiator cap controls the system pressure and the remaining components such as the hoses and connections. As the engine runs, it develops heat, the heated coolant runs through the radiator, cooled by air passing over and through it and then returns to the engine to cool more. This cycle is ongoing, as long as the engine is running, the coolant is constantly moving. What is the Purpose of the Coolant Housing? The system relies on numerous components, one of which is the thermostat. As the coolant flows through the system, if the temperature is high enough, the thermostat opens and lets the coolant flow through the radiator. If the engine has not yet come up to a designated temperature, the thermostat remains closed, directing the coolant back through the engine without the benefit of running through the radiator. The thermostat is located in the coolant housing which is usually located towards the front of the engine, above the water pump. The housing protects the thermostat from damage and directs the coolant once the thermostat opens. This housing is actually quite simple; it is normally made from a composite plastic material or cast aluminum. In some cases the coolant housing also contains a bleed valve. It is extremely important that air does not get in the cooling system; air can have a negative effect on the emission control system and can lead to early engine failure. Periodically the coolant must be changed; it can slowly erode components such as the coolant housing gasket or even the rubber hoses. When this happens, the coolant is drained, the system bled, engine flushed, and new coolant is put in. 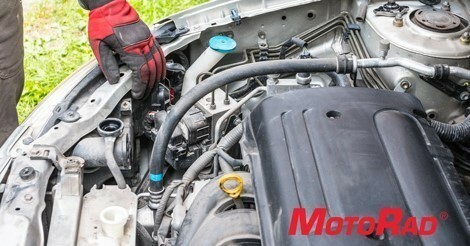 The technician will run the engine until it begins to heat up, open the bleed valve, and eliminate air in the system.